THE SEEKING. By Will Thomas. Edited by Mark Madigan. University of New England Press, 344 pages, 2013 edited reprint of 1953 original. The Seeking slipped under the radar, but deserves new attention. 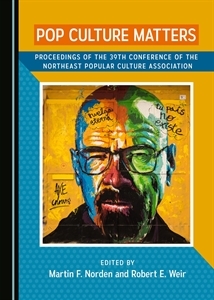 My copy literally got buried under an avalanche of titles that came my way and I failed to notice that my longtime Northeast Popular Culture Association colleague Mark Madigan, edited this volume. It should be considered a companion to Jane Beck’s Daisy Turner’s Kin (2015), which mines the same turf: experiences of African Americans in Vermont. The Seeking is, at turns, fascinating and frustrating. It was penned by African American journalist, novelist, and scriptwriter Will Thomas, the nom de plume of William “Bill” Smith (1900-70). He’s a nearly forgotten writer whose best-known work was his 1947 novel God is For White Folks. 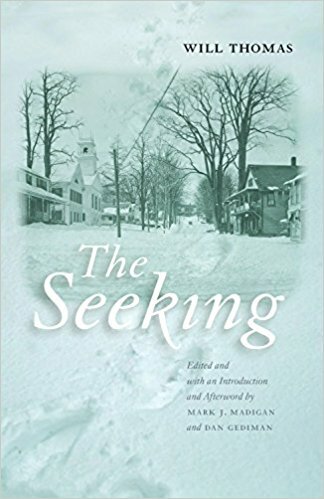 The Seeking focuses on the years 1946 to 1953, after Thomas sold his home in Los Angeles and moved his young to Westford, Vermont, a small village is a remote corner of Chittenden County. His reasons for doing so, by his own admission, were not entirely logical, and the fact that he first contemplated relocating to Haiti instead is testament to his conflicted mind. Thomas was a contemporary of Richard Wright and, like he, struggled to make sense of the vagaries of race in America. The Seeking is another challenge to viewing race as a simplistic binary. Thomas’ father was white and he didn’t begin to think of himself as black until after his father’s death. His mother moved the family from Kansas City to a black Chicago neighborhood, where Will assumed the last name of his African-American stepfather. Thomas later married Elise Leseur, who was 1/8th black, and they parented three children. The Seeking often feels as if Thomas is working out an identity crisis. It was a challenging time to do so. World War Two brought triumph over the perverse racial theories of fascism, yet American racial progress had scarcely advanced since the collapse of Reconstruction in the 1870s. By the time Thomas landed in Westford, he had abandoned Christianity as an oppressor’s religion and was on the cusp of losing his national faith as well. Thomas spoke with the fervor of a Frederick Douglass as filtered it through the accommodationism of a Booker T. Washington. This probably explains why his work fell into obscurity during the Black Power-influenced late 1960s. Thomas’ personal bifurcation comes across during his Vermont sojourn. Fiery words and complaints of racism stand side by side with vigorous pursuits of white patronage, burning desire to be viewed as a serious writer, and efforts to fit into rural Vermont village life. He was a casual friend of Wright and knew James Baldwin, but spent more time with black intelligentsia such as Ralph Bunche, Horace Clayton, Jr. and Chester Himes. By 1953, when Thomas published The Seeking and appeared on Edward R. Murrow’s “This I Believe” program, This’ tone was more that of the optimist than the activist. Thomas admits he was ready to take offense at every glance, frown, and stray word, yet he found warmth among flinty New Englanders. He does not make Vermont into a Utopia and notes casual animus towards Jews, Catholics, and French-speaking residents—not to mention the stray racial slur, but he found acceptance among his neighbors and respect from Vermont’s arts community. He is especially praiseful of Dorothy Canfield Fisher, the Green Mountain State’s grand femme de lettres. His account is out of synch with recent critics who charge Ms. Fisher was a bigot. Whom do we trust? Thomas’ prose is old-fashioned and lacks the timeless qualities of Wright or Baldwin. Little of book’s dialogue rings true. In fact, much of it has been deliberately crafted to enhance self-perceptions of literary brilliance, manliness, wisdom, and steely head-of-family decision-making. Elise Thomas emerges as a nay-saying foil for her husband’s musings rather than an independent mind or helpmeet. As NPR’s Dan Gediman reveals in the afterward, there is much about Thomas/Smith to tarnish his exalted claims—multiple marriages, a peripatetic lifestyle, shaky finances, and poor health. The Thomases divorced in 1955, with Will staying in Vermont until around 1960. It took sleuthing to unearth the final decade of his life. We are left with a tantalizing account of a black family in isolation in one of the whitest states in the Union. It makes a nice companion piece to Beck’s work on Daisy Turner, but what do we make of either book? My take away is that folks judge their neighbors differently than they categorize people in the abstract, that New Englanders respect honest effort, and a race-blind society remains elusive.